Attorney Bryan T. Symes Joins Weld Riley, S.C. The law firm of Weld Riley, S.C. is pleased to announce Attorney Bryan T. Symes has joined the firm as a shareholder. “Bryan’s expertise in labor relations and collective bargaining makes him an excellent addition to our Labor & Employment Section. We are excited to have him join our team,” said Steve Weld, President of Weld Riley, S.C.
Bryan has over a decade of experience representing business clients in the areas of employment law and litigation, labor relations and alternative dispute resolution. He is also a registered athlete agent and has experience advising professional baseball players. 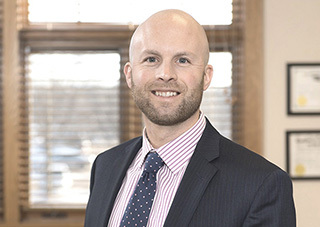 In 2009, Bryan was recognized in Minnesota Lawyer as Up & Coming Attorney and named Rising Star by Wisconsin Super Lawyers in 2011 and 2013-2016. In 2001, Bryan received his Bachelor of Arts degree from the University of Wisconsin – Madison where he majored in Political Science. In 2004, he earned his Juris Doctorate with honors from the Chicago-Kent College of Law. The Weld Riley, S.C. Law Firm was formed in 1991 and is comprised of Litigation, Labor and Employment, Business, Estate Planning, Real Estate, and Government Relations Sections. The firm employs 78 people in its Eau Claire, Menomonie and Black River Falls offices.